DroidRank is now in open beta! We’re very excited to announce that DroidRank (which we launched as closed beta a few months back) is now available to all our customers as a limited time open beta. It’s a great way to assess Android developers and we look forward to you taking it for a spin and sharing your feedback. Please read our previous detailed post on DroidRank to learn more what it can do for your mobile programming hiring! Author Arpit MaheshwariPosted on February 5, 2015 February 12, 2015 Categories Uncategorized3 Comments on DroidRank is now in open beta! The most common recruiter activity on HackerRank for Work is to invite candidates for screening tests. 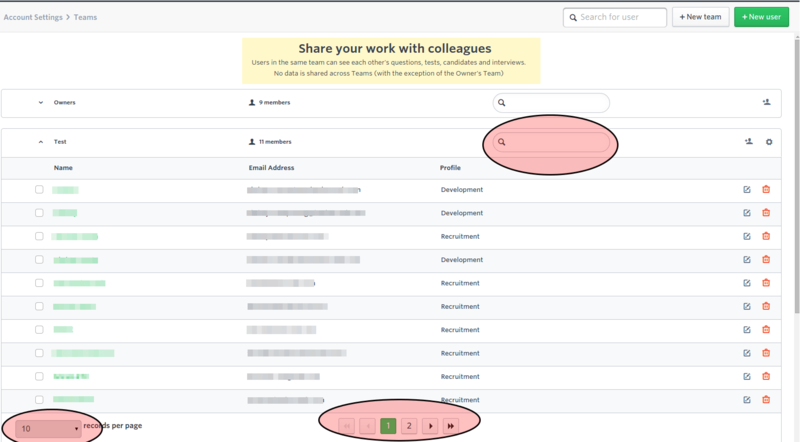 While the current interface already allows a user to invite multiple candidates, there are couple of scenario which are not handled well. If a recruiter has a list of candidate emails in excel, they have to convert it into a comma-separated list and paste. Also, there are cases where recruiters want to invite a lot of candidates (e.g. 500 candidates for a campus recruitment drive). In such a case, they typically face time out issues when using the comma-separated approach. 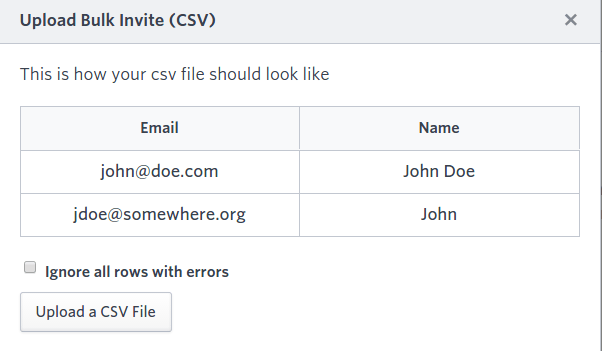 Now, you have a very easy way to invite candidates in bulk by simply uploading a CSV file containing a list of the email IDs (and optionally names) of the candidates. This is available on the invite interface as shown in the screenshots below. This upload functionality now allows you to send any number of invites without a timeout. Note: Currently, one can’t change the invite settings (invite email subject/body, invite expiry, candidate tags etc) when using the CSV upload functionality. Our next set of changes to this flow will allow this. Besides that a) The timeout issue for comma-separated approach will be fixed b) The recruiter will be able to track the delivery status of invite emails sent. Stay tuned! Feel free to share your comments on this change below. While we’re actively diversifying our products to help with phone interviews (CodePair) and other aspects of technical recruitment, screening tests continue to be extremely popular among HackerRank for Work users: a very simple way to shortlist good candidates by inviting them to take a test with automated assessment. This popularity means that over time a typical company would accumulate dozens of tests, making it hard to find specific tests, or to even browse through them in some logical way. We have had a ‘Starred Tests’ feature that allows certain tests to stick to the top of the tests listing, but we have had requests asking us to do more. Today we have rolled out the first of many planned enhancements to help you manage your tests suite better. You will find a new left-pane for the Tests home page, similar to what you must already be familiar in the home pages for CodePair and Library: using the left pane you will find that you can easily access tests created by you (“My Tests”), tests shared with you by other team members (Shared With Me) and tests marked with a star (Starred Tests). This, along with the search functionality present on the top of page, will help you quickly navigate to the tests of interest. We have more such enhancements in the pipeline, so stay tuned! What is your (HackerRank) CDN approach and what is the present change? Every time a user comes to our site, we pick from a list of CDN hosts that have the fastest response times. With the change today we are adding one more CDN to that list, boosting performance for some of our users. Majority of our users would not notice anything. If the new host is better for you, you would automatically benefit from it. The only users who may have to do something are those who have set up explicit domain white lists. We have set up domain whitelists for HackerRank. What exactly should I do now? You (or your corporate IT) should add the domain “static.hrcdn.net” to the white list. I do not understand what domain whitelists are / I am not sure if we are using a domain whitelist, what should I do? Will my work be affected? Don’t worry. You can ignore this update. Your performance will be no different from what it was before this change. You can always reach out to us at support@hackerrank.com in case of any queries. For every B2B product that involves usage by multiple people in the organization, it’s important that the product allows the right team settings to be configured in line with the actual organization. In line with this, HackerRank for Work continues to improve the “Teams Management” functionality. Our most recent changes make the “Teams Management” page much faster. We’ve implemented pagination per team so 10 members are displayed per team by default. This can be changed to 20 or 50 members if needed. Along with this, one can now search for a member in individual teams besides a global search. This simplifies the page and makes it very quick, while keeping all the existing functionalities. You can check these changes via Settings (click on your account name in top right) -> Teams Management. The engineering culture and infrastructure at HackerRank is built for speed. We build and deploy changes to our production infrastructure many times a day (if required). That is one of the joys of being a SaaS provider, and we pride ourselves on our agility and responsiveness. There is a downside to this agility as well. At times customers are surprised by some change and find it a bit annoying when there is no accompanying note explaining the change or the rationale. Today we are thrilled to launch a new in-product notification system to address this concern. Just look for the megaphone icon on the top-right of the title bar after you login to your HackerRank for Work account. If there are any updates on this blog since your last visit to your account, they will appear as a neat list which you can then click to read all the detail. Using this medium we plan to keep you update on new features, enhancements, and key bug fixes, notifications of scheduled downtimes and all such matters related to our service.